For the Irish cricketer, see Anne-Marie McDonald. 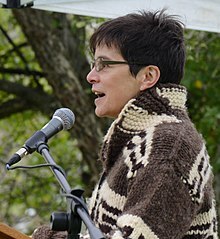 Ann-Marie MacDonald OC (born October 29, 1958) is a Canadian playwright, novelist, actress and broadcast host who lives in Montreal, Quebec, Canada. The daughter of a member of Canada's military, she was born at an air force base near Baden-Baden, West Germany. She is of Lebanese descent through her mother. MacDonald won the Commonwealth Writers Prize for her first novel, Fall on Your Knees, which was selected as a "pick" for Oprah Winfrey's Book Club. She received the Governor General's Award for Drama, the Floyd S. Chalmers Canadian Play Award and the Canadian Authors Association Award for her play, Goodnight Desdemona. MacDonald hosted the CBC documentary series Life and Times for seven seasons and CBC's flagship documentary program, Doc Zone for eight. She appeared in the films I've Heard the Mermaids Singing and Better Than Chocolate, among others. Her 2003 novel, The Way the Crow Flies, was partly inspired by the Steven Truscott case. Her novel Adult Onset was released in 2014 and is so far translated into five languages. She was the inaugural Mordecai Richler Reading Room Writer in Residence at Concordia University, and she coaches students in the Acting and Playwriting Programs at the National Theatre School of Canada. MacDonald is married to playwright and theatre director Alisa Palmer. ^ Cole, Susan G. (September 25 – October 1, 2003). "Ann-Marie MacDonald". Now Toronto. Archived from the original on September 29, 2007. Retrieved September 7, 2007.